Navy Chief Petty Officer Chris Kyle (SEAL), made a name for himself in four combat tours to Iraq. The insurgents called him, “The Devil of Ramadi,” a tribute to his deadly accuracy with a sniper rifle. They put a $20,000 bounty on his head. In his autobiography, “American Sniper: The Autobiography of the Most Lethal Sniper in U.S. Military History,” Chris recounted some of his experiences in Iraq and shared details of some of his kills. Credited with more than 150 confirmed kills, Kyle far surpassed the 103 confirmed kills (210 unconfirmed) credited to Vietnam-era Marine sniper Chuck Mawhinney. So when it was reported this weekend that Chris Kyle was shot and killed in Texas, the first thought that popped into my head was, “Al-Qaeda hit man in Texas?” That was truly a scary thought. But as the story emerged, it became known that it was an even bigger/sadder tragedy than first reported. Apparently, Chris and a neighbor, Chad Littlefield, who was also a veteran, were shot and killed at a shooting range, by a man who had gone to the range with them. As more details came out, the alleged shooter was identified as Eddie Ray Routh, a 25-year-old former Marine corporal. Chris was apparently helping Routh deal with the effects of Post-Traumatic Stress Disorder (PTSD), and the trip to the gun range was part of the program. Since retiring from the military, Chris had dedicated himself to trying to help his fellow veterans. PTSD is not new. It has existed for as long as there have been wars, and many suffer in silence for years. Well-known, highly-decorated soldiers, including Audie Murphy and Charles Durning, have suffered with PTSD and have been vocal proponents of the need for our government to do more to treat PTSD. Charles Durning was haunted for the rest of his life by the things he witnessed during World War II, which ended almost 70 years ago. I personally know Vietnam veterans who still suffer nightmares about their experiences in Viet Nam, nearly 50 years later. Why, in all that time, have we not developed a better way to treat our service members suffering with this disorder? The gun control lobby will have a field day, and will use this as another excuse to claim veterans shouldn’t be allowed to have guns. Chris was an ardent Second Amendment supporter, and would be really upset that his death would be used for such a political purpose. But the sad truth is that 3 more families are having to deal with the loss of a loved one, because we’re not adequately caring for our returning service members suffering from PTSD. When I heard the news reports about Chris, my heart sank. I knew we had lost an American hero. Chris and Marc Lee were teammates, and after Marc died in Ramadi in 2006, Chris became like an “adopted son” to Marc’s mom, my friend Debbie Lee . Marc was the first Navy SEAL to give his life in Iraq, in the same firefight in which Ryan Job was severely injured. Ryan was safely med-evac’d from the scene and flown to Germany and then home, where he underwent several years of additional medical treatment before finally losing his battle and his life. In several interviews, when asked if he had any regrets, Chris Kyle replied, “Yes, the guys I couldn’t save.” He was unapologetic about being good at his job, explaining that he only killed people who were trying to kill our guys, and that by killing them, he saved many more American lives. After seeing first-hand the despicable actions of the insurgents, he labeled them "savages." I bought a copy of Chris’ book months ago, but had not gotten around to reading it. So last night, I sat down and read it cover to cover in one sitting (yes, it took me all night). I felt I wanted to know more about this hero I’d heard so much about. And what I learned made me even more sad to know we had lost such a fine man and a true American hero. Chris Kyle was a man of courage and conviction, principled and humble. His loss is a tragedy for America, and for all who love freedom, but especially for his family, who waited and worried while he completed four combat tours in Iraq. He retired from the military to spend more time with his family, and to be there as his children grew up. Unfortunately, that is not to be. My heart goes out to Taya, Chris’ wife, and their son (age 9) and daughter (age 7), and the rest of his family, and to the families of victim Chad Littlefield and the shooter, Eddie Ray Routh. Chris’ loss is devastating to the Navy SEAL community and to our nation. "It's like a family member being lost, except Chris was a very special family member -- one with character, love of country, and consummate skill as a warrior," said retired Navy Captain Larry Bailey, former Commanding Officer of Naval Special Warfare Center in Coronado, CA, where Navy SEALs undergo basic and advanced training. 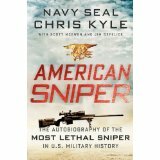 I highly recommend Chris’ book, American Sniper: The Autobiography of the Most Lethal Sniper in U.S. Military History and encourage you to read it. He tells us what it’s like to go through Navy SEAL training, gives us a look at what this war is like that we can’t see on TV, and gives us a perspective that can only come from one who has been there. It is written with humor and candor and grace, and will give you a much better appreciation for the magnitude of his loss. Chris had pledged to donate his share of the proceeds from his book to the families of Marc Lee and Ryan Job. Debbie Lee, who founded America’s Mighty Warriors to carry out Marc’s instructions in his last letter home, is accepting donations for Chris’ family. Make your tax-deductible donations at America’s Mighty Warriors, and be sure to mark it “Chris Kyle memorial.” Debbie pledges that all donations so marked will be given to the Kyle family. 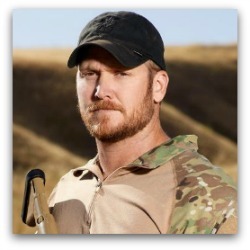 Please feel free to leave tributes to Chris Kyle and/or condolences for his family below. And before you go to bed tonight, be sure to tell your loved ones just how much they mean to you. You never know when it might be your last chance.